• Do you want a spice-type or vegetable-type chilli? Chillies can be divided into two types – spice and vegetable – depending on how they are used in the kitchen. Vegetable-type chillies are relatively large-fruited and thick-fleshed, and tend to be milder than the spice-type varieties. Because of their bulk, these chillies are used mostly as a vegetable, playing virtually the same culinary role as sweet peppers – they are ideal stuffed with meat, rice or cheese; chopped into salads or salsas; and cooked in stews, stir fries and omelettes. The spice chillies – including the habaneros and superhots – are generally small-fruited and thin-fleshed, and are usually hotter than the vegetable chillies. They are used to add heat and flavour to a dish, but contribute very little bulk. In addition, they are ideal for drying and milling into a powder. Some varieties are also very attractive and can be used as ‘edible ornamentals’, and do well as houseplants. • How hot do you want your chillies? Please note: the scale is highly subjective and depends on an individual’s tolerance to heat. • How large do you want your plant? Some chilli varieties will grow into large plants, e.g., Mulato Isleno and Pimiento de Padron. These need to be grown in the ground or very large pots. Other varieties will always be small statured, e.g., Stumpy and Prairie Fire. These are good in small pots, and can be kept as edible house plants on a windowsill. The varieties we sell vary considerably in size, and we give an indication of growth habit in each variety description. • How experienced a grower are you? There are five species of domesticated chillies, and some species are easier to grow than others. Most of the chilli varieties we sell are Capsicum annuum or Capsicum chinense, but we do sell a few C. baccatum varieties. If you have never grown chillies before we recommend starting with a Capsicum annuum or C. baccatum variety. 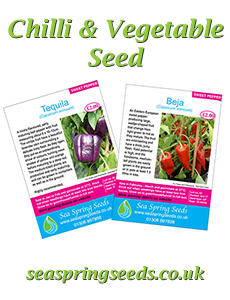 These are generally quicker to grow and faster to mature than the C. chinense varieties. Capsicum chinense chillies generally tend to require more care than the other species. However, they have a very characteristic fruity flavour that is a firm favourite for many people. They also include some very hot varieties, including the Superhots. Habanero is the generic name given to C. chinense chillies. For more information please see our habanero article.